For more than 20 years A6 Windows have been providing Dukinfield property owners a purpose made instalation service for Double Glazing Windows , Doors , Rockdoor, and Upvc Replacement Roofline using the best suppliers on the market today you know your property is in safe hands . All our double glazing windows and door installers Install to exacting standards and work directly for us , all from a Manchester replacement window company that takes great care and pride combined with a commitment to providing advanced energy efficient pvcu frames from Profile 22 and pilkingtons glass in all its Manchester replacement window and door installations to give your property that elegant new look at a cost to suit your budget. We supply to homes throughout the North West UK , that therefore includes much of Lancashire, Greater Manchester and Cheshire . We create supreme home improvements , professionally installed by reliable and skilled craftsmen , energy rated double glazing Astley that enhances the character (and value) of your Astley property . Our aim is to give our customers great value and outstanding service on a wide range of energy efficient double glazing upvc windows, doors , rockdoors , patio doors , French doors , porches and conservatories our aim is to make the best products affordable to all . Being a FENSA registered double glazing installation company allows us to register your double glazed windows and doors so your property complies with current building regulations. 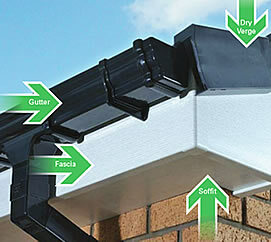 Roofline is the name given for the exposed timbers where your roof meets the outer walls of your home and gutters are fastened too .These timbers often go unpainted due to being high up and hard to access We provide and install all aspects of Upvc roofline using our team of approved installers. We are a Swish and Homeline Approved Installers and all roofline works comes with a 10 year guarantee. These products include fascia, barge boards, soffit boards, cladding and guttering We install these throughout the North West which therefore includes Greater Manchester, Lancashire and Cheshire.